On the 29th of April there was in Jerusalem a conference on the figure of Pope Roncalli. Gariwo interviewed Danny Rainer, of IRWF Jerusalem, about the results of this conference and the candidacy of John XXIII as a Righteous among the Nations. Could you tell me something about this conference, about the reaction after it? The conference on the figure of Pope Angelo Roncalli took place on the 29th of April. There were some important people from the Vatican, scholars from universities, people from different NGOs. 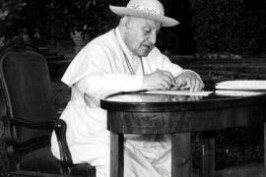 The conference was dedicated to Angelo Roncalli, Pope John XXIII, and to his action during and before his papacy, for example what he did when he was Apostolic Delegate in Istanbul and in Paris. This conference commemorates the 50th anniversary of his passing – he was born in 1963 – and had different panels: the first one dealt with Roncalli and the Shoah, and it analyzed the role of Roncalli in order to save Jews, the second one was chaired by Baruch Tenembaum – from IRWF – and was about Roncalli and the Establishment of the State of Israel; the third section dealt with Nostra Aetate and the Vatican Council II; and the fourth one was about the legacy of Roncalli. There were many attendance from the Vatican, there was the Latin Patriarch of Jerusalem Fouad Twal and the Custodian of the Holy Land Father Pierbattista Pizzaballa. The conference was very interesting, had a lot of echoes because there were many journalists from different newspapers and Mr Tenembaum was interviewed by them. During the conference we also handed over the Papa Roncalli dossier which we submitted to Yad Vashem in 2001 to promote the candidacy of Pope Roncalli as Righteous among the Nations. Did you get any reply from Yad Vashem about this candidacy? There was not any official reply from Yad Vashem, but in principle I believe that the opposition stayed in the fact that, according to Yad Vashem, Roncalli did not go against his superior, and this is one of the criteria that Yad Vashem applies when considering the candidacy of diplomats. And despite he was a very high profile figure who became pope, there is the issue of how Yad Vashem sees his superior Pius XII. Yad Vashem was very critical about this question. These are some considerations, but at least we didn’t get an official reply from them. Professor Yehuda Bauer took part as speaker in the first Panel. What did he say in his speech? He talked about Roncalli’s role in the Shoah? He made a very interesting discourse, but he did not speak about Roncalli. His intervention was about the example of several Catholics who, during the Shoah, saved Jews, and he analyzed the issue of how many Christians rescued Jews. Instead Dina Porat, Chief historian from Yad Vashem, presented a very structured lecture of what Roncalli did during the Shoah. Finally, what do you think is the legacy of Pope Roncalli, especially for Catholics-Jewish relation? I think that Roncalli during his life showed he was a very good friend of the Jewish world. He saved Jews, we have no doubt about that, and he had a very important role when he was nuncio, by helping the Jewish leadership, before the establishment of the State of Israel, to find a way to establish their State. He helped Moshe Sneh – the Jewish Agency representative – to go to the Vatican and try to convince the Pope not to force the Latin American countries to vote against the United Nation partition plan. Sneh contacted Roncalli and he arranged an audience with the Secretary of State of the Vatican, Cardinal Tardini, and convinced him that the Vatican should make pressure on the American countries on this issue, and eventually most of the Latin American countries voted in favor of the Resolution about the partition of Palestine. In addiction, we know what he did with Nostra Aetate, the document that removed one sentence that can be offensive – talking about the perfidious Jews – and that came from the traditional blame of “deicide” directed to the Jewish people. This revolutionary document opened a new era in relations between the Catholic Church and the Jewish people after centuries of prejudice and persecution. We have the feeling that his legacy is very important, and that Pope Francesco will follow it, trying to set better relationship between Christians and Jews and between Christians and any other religion.